Goldmine is the only county-wide independent radio station in Cornwall. Having launched on 1st January this year, each day many more listeners are making the ‘BIG SWITCH’ to the South West’s Goldmine. 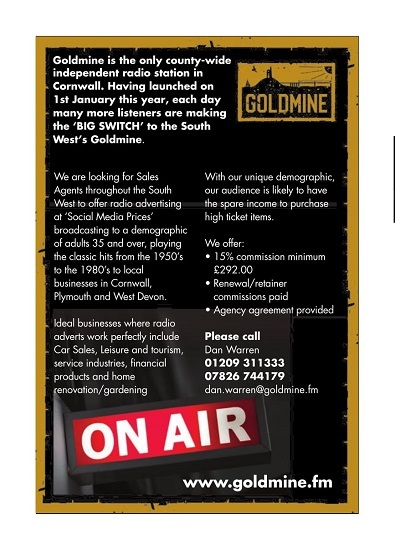 We are looking for Sales Agents throughout the South West to offer radio advertising at ‘Social Media Prices’ broadcasting to a demographic of adults 35 and over, playing the classic hits from the 1950’s to the 1980’s to local businesses in Cornwall, Plymouth and West Devon. With our unique demographic, our audience is likely to have the spare income to purchase high ticket items.